Richard M. Torres has more than 18 years of experience and leadership in mid- to senior-level HR management with an emphasis on business systems and continuous process improvements. 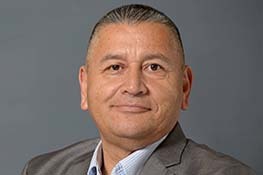 He previously held senior positions with American Air Filters International, La Posta Casino, NDC Infrared Engineering, Sunridge Nurseries Inc., Kern Health Systems, Home Depot and Donald C. Harder Corp. Richard served as general manager of Gazelle Transportation Inc.
Richard earned a B.A. in Business Administration from San Diego State University.